The Kali Kamai project by Wanphrang Diengdoh received the FICA Public Art Grant 2009. The project has been in progress for a year now and will now take to the streets of Shillong to engage with the public. The Khasi term Kali Kamai translates as taxi or more literally as a ‘car for earning’, and is the popular local mode of transport in Shillong, Meghalaya where the project is located. 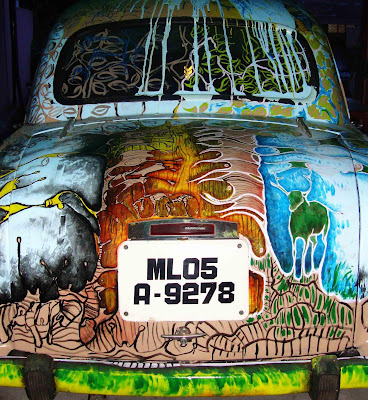 The project involves the alteration of the local share-taxi making it into a mobile-site to firstly, study the relationships between the individual and the city, and secondly, address the city’s history of conflict and prevalent undercurrents of racial tension. The artist views the Kali Kamai as a one of the few truly public spaces in the city where ‘the fine lines of race are blurred and will use this site to interface with the public through interactive audio-visual installations and one-on-one conversations. The Kali Kamai has been conceptualised and designed as a contemporary reflection on popular folktales that still exist in the oral tradition in the region. 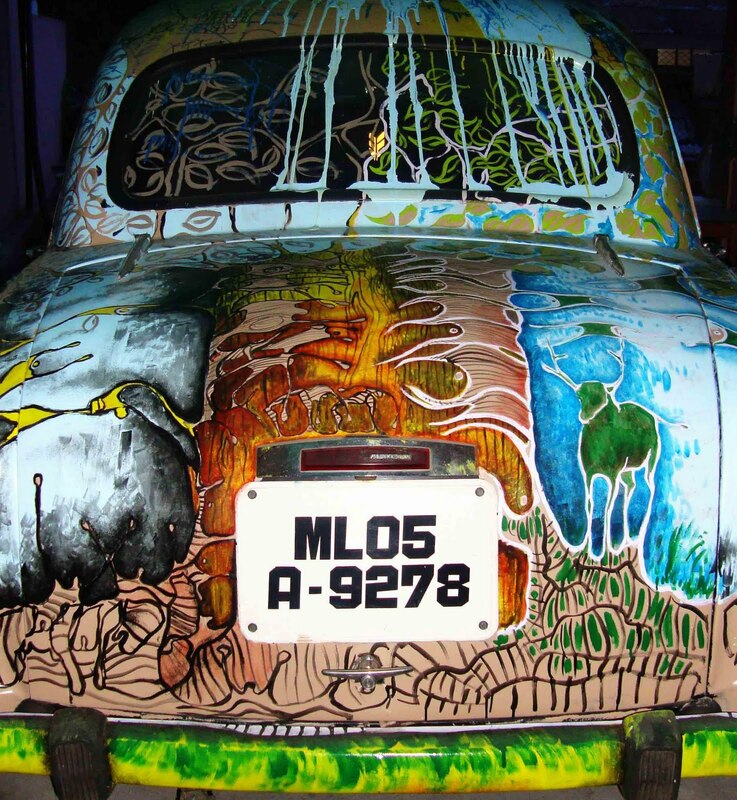 On each side of the vehicle we see painted the various narratives refering to Khasi folktale using contemporary references. The bulk of oral culture is still sustained by the people commuting in these public vehicles, though not direclty retold they emerge through reference and conversations that take place here, a space that Diengdoh has tuned into and has been documenting in the last year. To him this is the space where the links to histories, both personal and the community's, can be found. The documented material will be presented in the Kali Kamai on a touch screen, urging the passengers to explore and exchange stories during their journey across the city. Wanphrang K. Diengdoh has a BA in Mass Communication from St. Antony’s College, Shillong and MA Mass Communication from MCRC, Jamia Milia Islamia, New Delhi. He is an independent photographer, has directed and edited a few short films and as a musician is part of Stitch, a Delhi-based rock band. His 36-minute short fiction film, “19/87”, made with Dondor Lyngdoh, won the best film, best cinematography and best screenplay in the competition section at the first Guwahati International Short Film Festival (GISFF), 2011.